I love making handmade gifts, especially for new little babies that happen to be my nephew! Making things from scratch is always an eco-friendly alternative. Not only do I know where the item was made, I know what it was made with. This little gift was made in my home, with love. For Easter I made my little nephew his very own little bunny. By using a few scraps of flannelette, from another handmade gift, I didn’t have to go out and purchase anything to make this keepsake bunny. 1. Draw a bunny shape on the piece of paper (you could make any animal; bear, cat, giraffe, etc). 2. Draw a line 1/4″ larger than your original bunny shape…this will provide your seam allowance. 3. Cut along the outer line. 4. Pin the pattern onto the right side of your fabric and cut out your bunny shape. Repeat for the second piece of fabric. 5. Using needle and thread hand stitch a face onto the bunny. You may also like to sew any other details, like ears. 6. To make the tail, place a ball of stuffing in the centre of a 2″ square piece of flannelette. 7. Fold the ends of fabric into the middle and hand stitch in place. 8. Once the ball is created, hand stitch the tail into place on the back of the bunny. 9. Turn bunny cut-outs right sides together and pin. 10. Sew, either by hand or with a machine, sew 1/4″ from edge of the fabric…leave a 1″ hole, so you have a spot to turn the fabric the right way around. 11. Turn the bunny right side out. You may use a pencil or bone folder to poke out the tips of the bunny ears, hands and feet. 12. Stuff the bunny with the filling. 13. 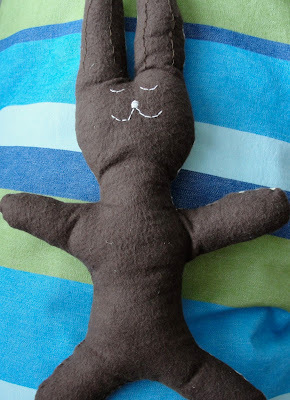 Use a simple whip stitch to close the hole in the bunny. He’s done! This sweet little bunny is done. I have made many bunnies over the years, for my girls and my other nephew. A simple gift for any occasion. This technique can be used for making any animal or creature you can think of. Do you make handmade gifts for your family and friends? If you are looking for ideas for other simple handmade crafts, be sure to check out the link up Made with Love. This is super cute. I look forward to seeing you at My Dream Canvas! This is super duper cute!! Loved the idea.. Im going to try this for Easter.. next year.. Have book marked it.. Thanks for linking in to Made with Love! !